Yesterday, I began reading Ernest Hemingway's For Whom the Bell Tolls. Although many critics consider it to be one of the finest novels ever written by an American author, I worry its themes of death and suicide will prevent me from appreciating Hemingway's brilliant prose. I knew the title was a reference to a poem, but must confess, I did not know to which poem it referred. I assumed it was a poem about love and romance. My assumption proved woefully incorrect. John Donne, an English poet, satirist, and clergyman, wrote "for whom the bell tolls" in his Devotions Upon Emergent Occasions, Meditation XVII: Nunc Lento Sonitu Dicunt, Morieris. "Perchance he for whom this bell tolls may be so ill, as that he knows not it tolls for him; and perchance I may think myself so much better than I am, as that they who are about me, and see my state, may have caused it to toll for me, and I know not that. No man is an island, entire of itself; every man is a piece of the continent, a part of the main. If a clod be washed away by the sea, Europe is the less, as well as if a promontory were, as well as if a manor of thy friend's or of thine own were: any man's death diminishes me, because I am involved in mankind, and therefore never send to know for whom the bell tolls; it tolls for thee." As a clergyman living in the seventeenth century, Donne was something of an expert on death. From an early age, he would have been witness to the effects of war, famine, pestilence, squalid living conditions, and barbaric medical practices. He would have known the Reaper lurked in every dank, dark corner of Tudor London, always present, always ready. In Donne's day, tolling church bells usually signaled a funeral. 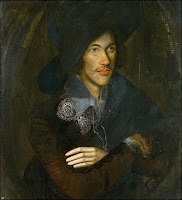 Reading the poem, I wonder if Donne meant to say that all men are connected; that the action of one affects many. Or, perhaps he was saying that each time a bell tolls we should remember death is imminent, certain. I do not like to associate death with the line: for whom the bell tolls. I enjoy listening to bells tolling, for it makes me think of a bride and a groom standing before an altar, of their hopes for a union filled with love and laughter. Even the line - for whom the bell tolls - has a romantic ring (This should not come as surprise since Donne was one of the first metaphysical poets to pepper his prose with romantic metaphors). Still, it sounds like something a romance novel hero would say when proclaiming his undying love to his lady. "For whom does the bell toll, thou ask? It tolls for thee, my lady. Each ring is but a declaration, an affirmation, of my love. When next you hear it, know 'tis not truly a bell, but me whispering, 'I love you.'" I do not wish to think on death. And I pray, now that I know the meaning of the poem, I will not think on death when I hear a bell tolling. I do not wish to think of loss - especially the loss of those I love dearly, those who have fluttered into my world with the grace of a butterfly. But life is like a butterfly, isn't it? Wondrous and fleeting. like butterflies on an autumn breeze. I do not want to think of those I love as lifeless specimens, pressed between the pages of my memory. I want to remember them in their glory, fluttering freely, spreading joy. It's amazing, the power we have to touch one another's hearts, isn't it? We can know someone for a brief period and yet feel the affects of their beauty for a lifetime. I shall finish For Whom the Bell Tolls because I honor Hemingway's literary genius and because I know I must face the eventuality of death. I will finish Hemingway's novel but I will not allow it to alter my feelings about the ringing of church bells. When I hear that joyful gong, I will think on those I love and have loved. Just remember each time the bell rings, an angel gains its wings. In some hearts Robert did not die. Hemingway left himself an "out." He was armed and had Perhaps he lived and loved, if only for another day. The instinct to live is only there if you believe the next day might be a good one. I live my life believing that tomorrow will be better than today. I've had quite a few awful today's the last few years and the HOPE for a better tomorrow is what has kept me going. Hope is a powerful fuel.